Note: This and other Easter ideas can be found on my Easter activities for kids page and my Easter printables page. 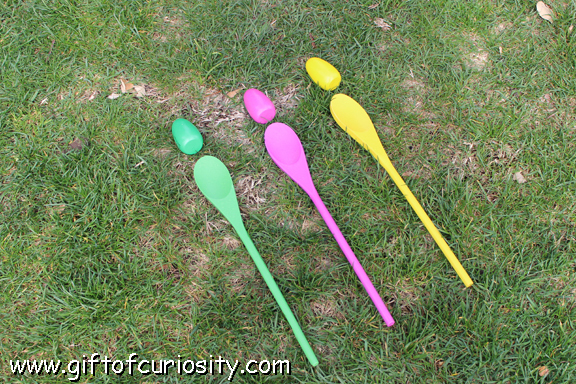 The spoons and eggs we used are part of the Egg-Citing Egg Spoon Game Set from Oriental Trading Company. The set includes six wooden spoon and matching wooden eggs in different colors. I took my kids to the park one day where we had access to some wide open grass. 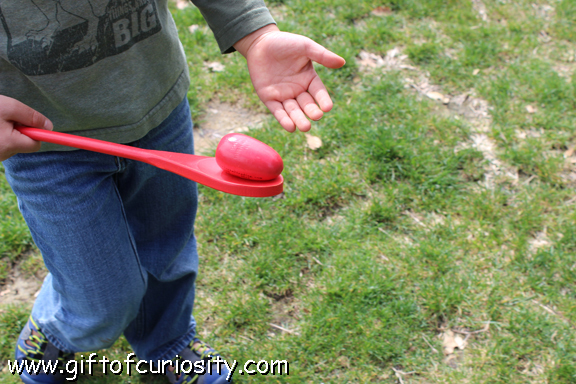 I set up our egg and spoon game by giving each kid three spoons and three matching eggs. 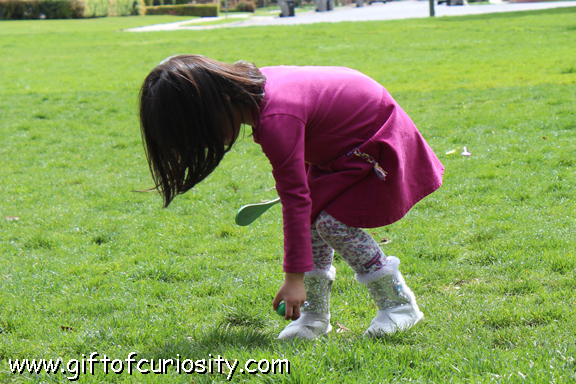 The idea was for the kids to pick up a spoon, place the matching colored egg on the spoon, and then carry the egg and spoon across the grass without dropping the egg. They learned that they had to hold the spoon very steady and walk at a measured pace. 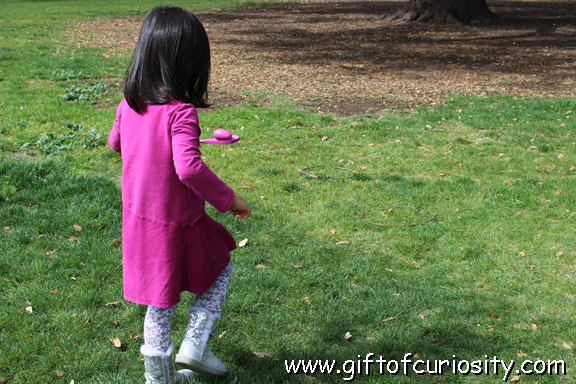 The kids carried their eggs across the grass to a target we had set up on the ground. 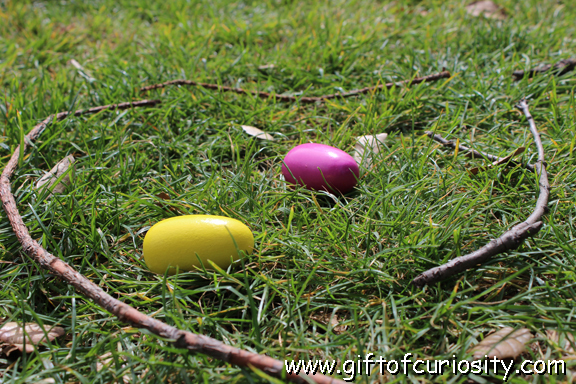 Upon reaching the target, the kids dropped their eggs in. To play competitively, you could have your kids work individually or in teams to get their eggs into the target. 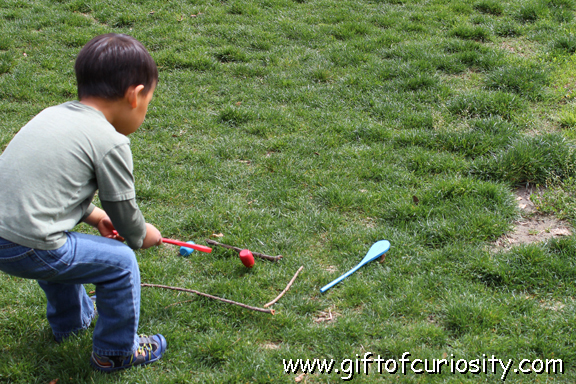 The first kid (or team) to get all their eggs to the target would win. 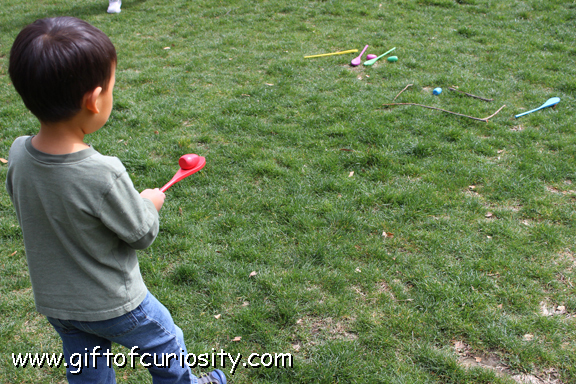 To play cooperatively, you could have your kids form one relay team. As a relay team, only one kid moves their egg at a time, and only after the first kid has placed their egg in the target does the second kid get to go. The goal is for the relay team to get their all their eggs to the target as quickly as possible, working together as a team. You can time the team and play more than once so the team has a chance to beat its own time (rather than having one team trying to beat another). Want to play this game with your kids? 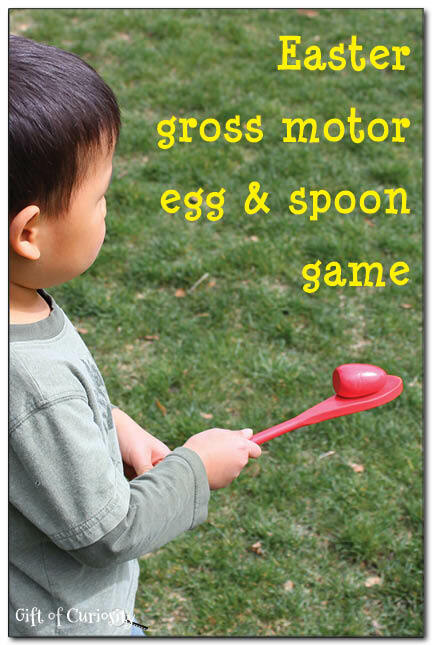 Check out the Egg-Citing Egg Spoon Game Set from Oriental Trading Company! I love the bright, cheerful colors of the spoons and eggs. The wooden eggs also have a nice weight to them that keeps them from falling off the spoon too easily. My kids really enjoyed this game and it was at just the right difficulty for them – not too easy and not too hard. I like this version a whole lot better than the one that uses real eggs! lol! Just as fun and a lot less messy! So true about less mess! This looks like great fun! A new take on a traditional game-I like it! Oh, I love this! I remember playing a similar game when I was a child, and I had completely forgotten about it. Thanks so much for sharing this fun idea!